Most celebrities are so beautiful that they need just a once of makeup to look gorgeous. However, many of us have the luck of sporting such a perfect complexion that ruining it with heavy makeup is just a crime. For everyone in between, no-makeup makeup is fortunately available to feel confident even when you don’t wake up feeling like a newborn cherub. Although a world without makeup would probably be better (even if much less interesting), for all those who want to learn how to pull off a no-makeup makeup look without so much hassle, here are a few useful tips. A natural look can only be achieved if your skin looks glowy, bright, and youthful. In other words, you must enhance the beauty of your natural skin, so if it looks oily in the first place, the whole no-makeup makeup look is not going to look pleasant at all. Preparing your skin first and foremost is the first step of your journey. Start with some skin cleaning to remove any trace of impurity. Then moisturize your skin with a hydrating face mask before applying makeup, so it’s supple and luminous. That’s more or less the bread and butter of all no-makeup makeup routines. This doesn’t mean you should not use foundation at all, but you definitely want to avoid looking cakey by piling on the product. Probably, the most efficient solution is to opt for a tinted moisturizer to even out your skin tone. If possible, choose one with a high SPF to protect your skin from sun rays. A concealer can be used to hide any facial flaw, but it must be used sparingly and only where you need it most, or your makeup will look too heavy. For example, just use a touch of it when you need to disguise a discolored skin patch. In other words, try to go light with coverage. A key concept of the no-makeup makeup is that you want some of your imperfections to shine through, such as freckles and redness, provided they’re nice to look at. Cream makes everything blend and looks natural than powders. If you want to open up your eyes instantly, match cream eye shadow with skin tone and then apply a lighter shade in the inner corners. Try to blend the shadow up from your lash line, and then fade as it gets closer to your brows. Then blend a cream bronzer with a damp sponge to blend everything and let it sink right in. The final touch to complete your natural-looking makeup look is adding some color to your lips (but not too much). Instead of using an intensely colored lipstick, go for a tinted balm to deliver nothing more than the perfect amount of color that highlights your lips’ natural hue rather than coloring them. The idea is to find a product that gives you the look your lips get after you eat a popsicle, possibly without the sticky hands. If you don’t have a lip tint available, you can simply apply any lipstick and then blot off the excess with a tissue. 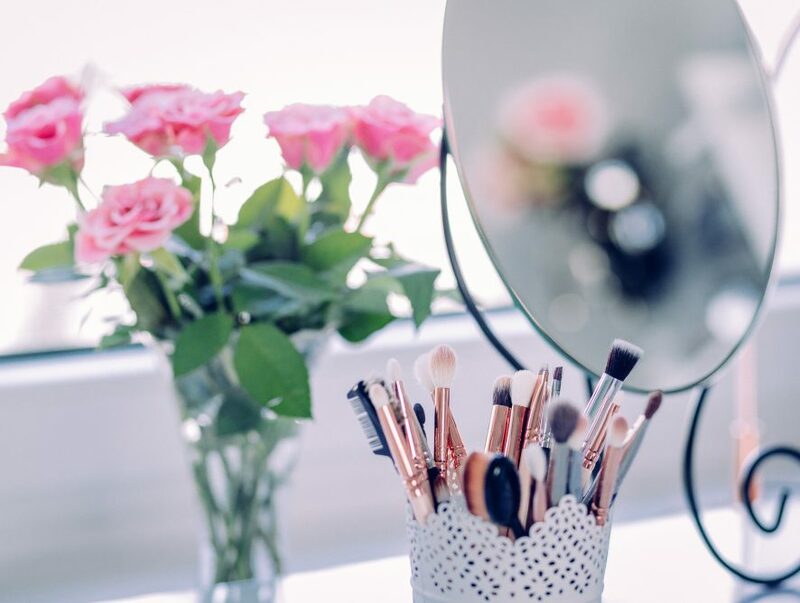 Whether your weekend plans involve spending a day outside or enjoying some time with your friends, an easy, no-makeup makeup can be achieved in just a few minutes by following our tips. With nothing but a few brushes here and there, you can pull off nearly the entire look using just your fingers, so it doesn’t get much simpler than that.